Don’t miss Apple Day on October 12th 2013, 11am – 4pm. 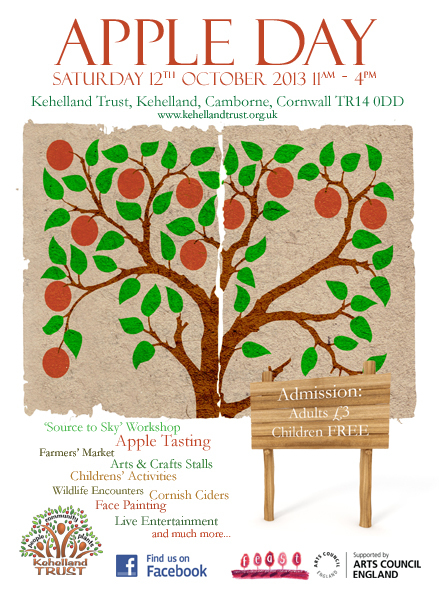 Come and join us for ‘Source to Sky’ workshops, apple tasting, farmers’ market, arts and crafts stalls, childrens’ activities, wildlife encounters, Cornish ciders, face painting, live entertainment, and much more. It’s going to be a great day! Don’t miss out on the Cider Stomp in the evening, 8pm till midnight, featuring live music from Black Friday and Biere De Luxe.